Hunter Douglas’s first major ceiling project using an engineered solid wood baffle system has been completed – and it has been hailed a huge success. 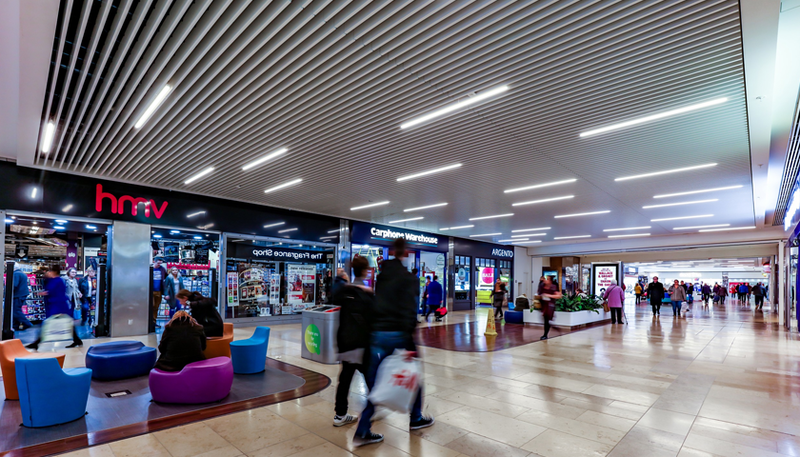 Award-winning international architects Benoy, which designed the £8 million refurbishment at Queensgate Shopping Centre, in Peterborough, England, specified Hunter Douglas to manufacture the ceiling for all the main areas of the mall. The leading architectural products company manufactured and supplied 1100m2 ESW grill ceiling, with slat dimensions of 150mm x 25mm and a 75mm gap. A total of 1000m2 was finished in pure white RAL9010, while the remaining 100m2 was finished in walnut veneer. Hunter Douglas also manufactured and supplied 1500m2 of Cell 50E – its aluminium open cell system – with a 120mm module in white for the scheme, the first it had undertaken for Newark-based Benoy. David Harris, general manager of Hunter Douglas UK, said: “The Queensgate refurbishment was important to the people of Peterborough, who now have a modernised shopping centre to enjoy, and it was also a milestone for Hunter Douglas because it was our first major UK project to use the baffle system. There were a number of challenges with the installation, relating mainly to the number of services contained within the ceiling void, which led to installer CID Ltd having to reduce the ceiling height to circumvent any issues. For more information please visit the Hunter Douglas website.